He says in 3.02 what I haven’t been able to say in thousands of words, I feel inadequate, in awe and grateful. I believe that any society should treat its old folk with respect and consideration. We all, whether we like it or not, come from hunter gatherers. In indigenous populations the world over the old are respected for their wisdom. They are cared for in family groups and not shut away as we do in the west. I saw an article today which seems to equate the way we deal with the old and infirm as equivalent to torture. It is time we took a long hard look at how we deal with our parents. 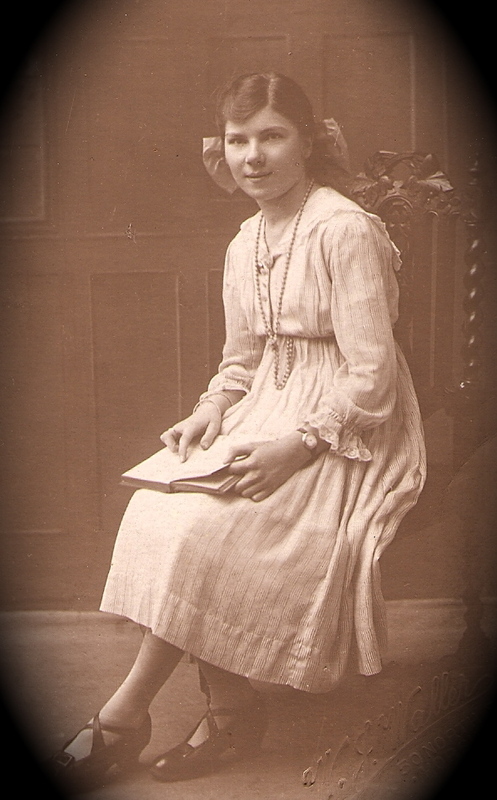 The photograph is of one of my relatives as a young girl. She was fortunate and never needed to be placed in a home. Part of what I do now is to try and protect the elderly from the profiteering of the owners of ‘Care’ homes. It seems to me a truism that the powers entrusted with investigating abuses in care homes find the task unpallatable. The legislation is far from perfect. The lawyers who advise have conflicting views and a desire to save their budgets for more ‘high profile’ jobs. The supervisors often believe that either the problem does not exist, or if it does it will be too resource intensive to be thoroughly investigated. The government must shoulder part of the blame, not only for the apalling legislation but also for the reduction in funding. Without investigators on the ground, from CQC to Police to Social Services, how do they think such matters will be resolved. Of course the view may well be that the elderly do not contribute much to the economy of this green and pleasant land. They are also heavy users of resources. This view deliberately ignores and obscures the truth. Without the elderly there would be no green and pleasant land. They laid the foundation of prudence and thrift which now seems long forgotten. If the spoilt individuals in Parliament never had to worry about money, the dominant majority being born to money, why do we expect they would understand thrift and the point behind saving. The elderly often become invisible because they are tucked away, out of sight out of mind. Left to fester in ill run homes where, the sooner they die the more profit for the homes and the families. This allegedly United Kingdom is riddled from floor to ceiling with self serving greed. The old relations can be dragged out once a week for tea then put back in their box to suffer the long lonely days until they truly give up and slip from their earthly existence. Other cultures look after their elderly. They have a greater social conscience. The elderly can help look after the children, they can amuse and impart knowledge with their stories an knowledge. They are seen as continuing to contribute to the well being and the social stability of the nation / group. I should love to see a nation of philanthropic giving. Of the closure of most, if not all care homes. If the elderly are sick, they should have free unfettered access to health care. If they are infirm they can stay at home or live with their children or communities. Young people are now mobile, but that mobility comes at a price. No longer do children live, as a rule, in the same town / village / neighbourhood as their parents. Surely with all the wisdom gained by the previous millenia we must be able to solve these problems in a dignified and humane way. Muddling through the maze of other people’s lives as if they, or anyone else, else really cares. It seems strange that as world problems increase in size, the Police seem to be reduced to meddling in the lives of the ordinary citizen. Unwanted, unloved. ‘Help help please come quick.’ ‘Why are you here F**k off and let us be.’ These are the cries I constantly hear from the ‘customers’ I deal with daily. It seems no -one is able to sort out their own life or indeed take responsibility for it. We live in a sound bite age. Politicians, as they have always done, promise much but deliver little. Thecountry is up in arms about standards in care homes we are told. The government want positive action. However, the laws are, according to CPS, badly drafted. Cynical as I am I read this as being drafted to help the care home owners get rich at the expense of the vulnerable. There is no redress for the old and infirm. Close a care home down sure. The managers are not brought to account but we may be able to prosecute a poorly paid, poorly trained carer. Justice is depicted as blind but is she when the law is drafted by the blinkered self obsessed fools of Westminster who have not even one toe in reality?